Western and central Africa are facing one of the biggest choleraepidemics in their history, the World Health Organisation and the United Nations Children’s Fund said last month, in reporting that more than 85,000 cases of cholera have been registered since the beginning of the year, with nearly 2,500 deaths. Unicef has identified three main cholera epidemic outbreaks in the LakeChad basin, the West Congo basin and Lake Tanganyika. The disease, which is spreading along watercourses, has been made worse by the recent rainy season. Five countries – Cameroon, Ghana, Nigeria, theDemocratic Republic of the Congo (RDC) and Chad – account for 90% of the reported cases and fatalities. Cholera is an acute intestinal infection caused by the Vibrio choleraebacillus. It is still one of the clearest indicators of social development. The disease spreads through water, which has been in contact with the faecal matter of infected people, reappearing periodically in countries unable to secure access to clean drinking water and adequate sanitation. Almost all developing countries are plagued by occasional cholera epidemics, facilitated by the short incubation period, which ranges from two hours to five days. But it is a long time since central and western Africa suffered such a serious epidemic. „The highest rates of contamination are in Chad, Cameroon – where nine out of 10 districts are affected – and western RDC, where the mortality rate is over 5%,“ Unicef spokeswoman Marixie Mercado said, adding that the rate is over 22% in some regions. These figures are particularly dramatic, given that with appropriate treatment – antibiotics and intravenous rehydration – mortality can be brought down to 1%. One reason for the high mortality rate is the lack of medical care. A lack of public awareness is also a factor. The current peaks in the epidemic are in areas where the disease is not endemic, according to the UN agencies. „We have just received reports of a sudden outbreak of cholera in theCentral African Republic, where the disease has not been seen for years. That means people are less aware of how to prevent an epidemic and how to react,“ Mercado said. 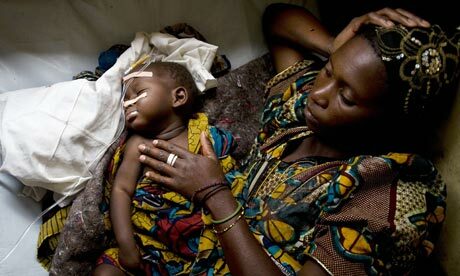 In Congo the disease reappeared in September in provinces where it had not been reported in the past decade. Most of the people infected display no symptoms and the bacillus may survive in their faeces for one to two weeks. If the disease does break out, 80-90% of cases are harmless or only moderately severe, making it difficult for doctors to distinguish them from other forms of acute diarrhoea. So it is vital to raise individual and community awareness to prevent the disease from spreading, all the more so in countries where most people do not have access to clean drinking water and latrines. The situation seems particularly serious in Chad, where the WHO had registered 16,000 cases and 433 deaths by 5 October. „Some 6,500 cases of cholera were reported in 2010 and the epidemic has never really stopped since. Whereas the period before the rainy season is usually fairly quiet, the first cases this year appeared in April, without us being able to identify the origin of the outbreak,“ says Michel-Olivier Lacharité, the regional head of Médecins Sans Frontières. The epidemic has affected more than half of Chad’s health districts and in September it reached the area bordering on Sudan. Since the beginning of the year, 350 MSF staff have been working there, spread over 23 sites. „The worst of the epidemic is in the capital. Outside N’Djamena we hope that the peak of the epidemic may be past, particularly with the end of the rainy season,“ said Antoine Peigney, head of international operations at the French branch of the Red Cross, which has set up a cholera treatment centre. It aims to take charge of 65,000 people, comprising 3,000 patients receiving treatment, and thousands of families who will be targeted by campaigns to raise awareness of the importance of hygiene, which is essential to containing the epidemic. This story originally appeared in Le Monde.